This bespoke beast is 35 feet long and weighs a whopping 24 tons. 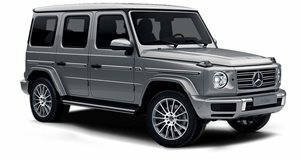 The Mercedes-Benz G63 AMG 6x6 is a massive off-roader, but it’s minuscule compared to this bonkers creation. Designed by Dubai-based car collector Sheikh Hamad Bin Hamdan Al Nahyanby, the humungous SUV, dubbed the "Dhabiyan", is part Jeep Wrangler, part Dodge Dart, and part Oshkosh M1075 military truck. Measuring 35.4 feet long, 8.2 feet wide and 10.4 feet tall, the Dhabiyan is being hailed by its creator as the world’s largest SUV. The ten-wheeled monster SUV is described as a "desert ship” and weighs a whopping 24 tons. The Dhabiyan is based on the US Oshkosh M1075 military truck and is equipped with the truck’s original 15.2-liter Caterpillar diesel engine producing 600 horsepower. No performance specifications have been revealed, but it probably isn’t very fast off the line considering how much it weighs. To create the unique and menacing design, Sheikh Hamad merged the front of a 1940s truck, the cab from a modern Jeep Wrangler Unlimited, the lights a Ford Super Duty and the rear bumper from a Dodge Dart. We wouldn’t like to guess how much this behemoth would have cost to build. While you can watch a video of the Dhabiyan tearing up the desert, the enormous SUV is believed to be currently on display at the Emirates National Auto Museum. Sheikh Hamad is well known for his crazy car collection, although the Dhabiyan is undoubtedly his most insane creation yet. When he got married, he had Mercedes-Benz build him an S-class for each color of the rainbow from the upholstery to the wheels, which earned him the nickname "The Rainbow Sheikh”. He's also well-known for his 64:1 scale Dodge Power Wagon that comes complete with four air-conditioned bedrooms, a living room and a bathroom.